Today was very gray, I know. 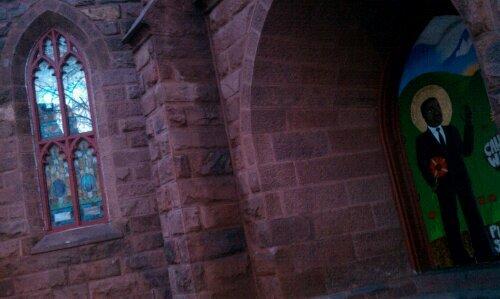 An hour ago, I spoke to The Rev. Karen Brau of Luther Place on 14th Street about a very special piece of public art, which was unveiled this week (how apposite!). “St. Martin of Birmingham” joins a mural of St. Francis at this congregation, which has been concerned with social justice and our community for several decades. More, tomorrow. Rebecca Sheir introduces us to Lynn C. French, whose African-American family has deep roots in the D.C. area… and a rich history/legacy of education. 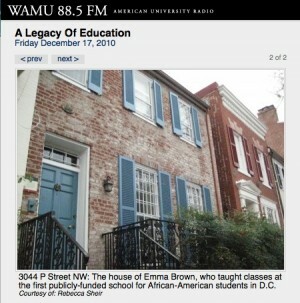 Her forebears include Emma Brown, who founded one of the first schools for African-Americans in D.C., and several of the early trustees of Howard University.